I chose for my research project Smolensky cemetery on Vasilyevsky Island, the oldest continuously operating cemetery of St. Petersburg. Researching Smolensky cemetery has been both a privilege and a pleasure. Specifically I focused on the cemetery as a common place shared two communities: the Orthodox parish and the local goth community. In the course of my research in St. Petersburg I was able to interview Father Victor, the archpriest (протоиерей) of the Smolensky and leader of the vibrant and growing parish. Father Victor struck me as an amazing person who emanates positivity and light. 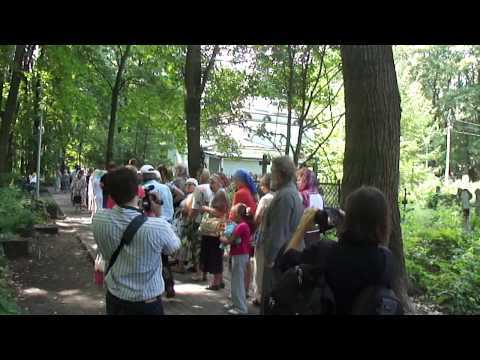 After the interview he took us to the locations where St. Xenia of Petersburg, the patron saint of the city, is buried. The cemetery is more of a place of pilgrimage than what I had been led to believe by the sources that I found when I did preparatory research in Swem Library and online in Spring. There were pilgrims from as far as Israel and Greece there to visit St. Xenia. I was also lucky enough to get the interviews I needed with local members of the Goth community who spend their time in the cemetery. The cemetery is the location where they seek respite from the city and to indulge in ‘dark romanticism’ as they call it. I have a great time taking B-roll footage of the cemetery. I have collected a tape full of elegiac shots of wooded graveyard scenery with the sun emerging through trees and rain. In the next couple of days I will be recording ambient sound, too bad Professor Therkelsen had to leave with his audio recorder! All this material I will use in a five minute documentary I will be assembling in the fall semester. I’m eager to begin the editing process and can’t wait to start it when I get back to WM in the fall! I really hope my documentary provide a fascinating portrait of these diverse communities making very different sense of this historical cemetery. This entry was posted in Classes, Excursions, Research, St. Petersburg, Vasilyevsky Island and tagged College of William and Mary, Research, Russian Studies, St. Petersburg, Vasilyevsky Island, Васильевский остров. Bookmark the permalink.